To the west of the Former Imperial Palace in the center of Beijing lies a vast expanse of water known variously in ancient times as Western Lake or Celestial Lake. The Celestial Lake is divided into Beihai, Zhonghai and Nanhai lakes, but the Beihai Lake is the most famous. As early as 800 years ago, the lake had already been developed into a gigantic imperial garden. Thanks to painstaking construction efforts during the Yuan, Ming and Qing dynasties, the Beihai Park has grown into what we see today, an outstanding example of Chinese art of garden construction and horticulture situated right in the heart of Beijing. The Zhonghai and Nanhai lakes, known together as Zhongnanhai, has become the nerve center of China; it is the headquarters of the central committee of the Chinese Communist Party and the Central Chinese Government. The Beihai Lake has long been converted into a public park. Legend has it that in the ocean there were three celestial mountains, Penglai, Yingzhou and Fangzhang, where celestial beings all lived in gorgeous pavilions and were in the possession of pills of immortality. Qinshihuang, who founded China's first feudal dynasty, and Emperor Wu of the Han Dynasty, had dispatched trusted officials to search for the pills of immortality, but nothing came out of their efforts. In disappointment, the emperors began building celestial islands on waters close by their imperial palaces, thereby converting fantasy into reality. Beihai Park was exactly built according to this legend. The lake itself is reminiscent of the ocean, and the Qionghua Isle in its center is "Penglai". The circular city on the southern bank is Yingzhou, and the Xishan Terrace is none other than Fangzhang. 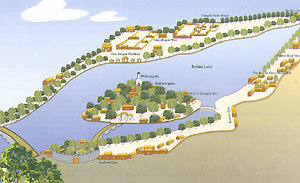 In the past both the Circular City and Fangzhang stood in the lake; it was not until the Ming Dynasty that they were linked with the shore of the lake. The buildings in the Beihai Park are laid out with the White Pagoda on the Qionghua Isle as the center. In the south of the pagoda are the Hall of Karma, the Hall of Universal Peace, and the Hall of Enlightenment, forming a group of structures that extend to the Circular City by way of the Archway of Cloudy Hills and Accumulated Verdure along an axial line that extends from south to north. East of the isle is the Hall of Wisdom Pearls, the Wooden Archway and the stone bridge, which form another axial line. Around the isle are scattered several dozen halls, chambers, halls, pavilions, terraces and kiosks, linked to each other by corridors. The buildings are laid out in the fashion of a maze. The eastern and northern banks of Beihai are clustered with buildings as well. The Pavilion for Quiet Meditation and the Painted Boat Studio are tucked away in the woods behind the hill. The Five Dragon Pavilions stand abreast at the waterfront. The Tranquil Heart Studio is a garden in its own right. These man-made buildings combine with natural landscape to form a splendid imperial garden.